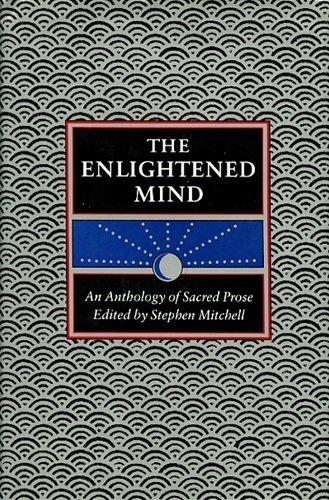 This collection of sacred prose is the perfect companion to The Enlightened Heart, Stephen Mitchell’s anthology of sacred poetry, and to his bestselling Tao Te Ching. The Enlightened Mind contains discourses, essays, sermons, and aphorisms from the world’s great religious traditions, many of them in new translations by the editor. 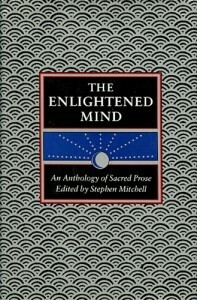 It includes texts from the Hindu, Jewish, Buddhist, and Confucian scriptures; Heraclitus and Plato; Chuang-tzu and Jesus; the Tibetan Book of the Dead; the Chinese Zen Masters; the Sufi masters; Meister Eckhart, Dame Julian of Norwich and other Christian teachers; Montaigne and Spinoza; the Hasidic Masters; Native American orators; and modern writers like Blake, Emerson, Rilke, Einstein, Kafka, and Simone Weil. The modern Indian sage Ramana Maharshi once defined a genuine seeker as someone who has “a constant and passionate longing to break free from life’s sorrow—not by running away from it, but by growing beyond his mind and by experiencing in himself the reality of the Self, which knows neither birth nor death.” Longing is, for most of us, an essential stage in spiritual life. This anthology and its companion volume, The Enlightened Heart, collect the poetry and prose not of longing but of fulfillment. The men and women who speak to us from these pages have each, to a greater or lesser extent, entered the kingdom of heaven. In order to tell us about what is unknown and unknowable, they have to speak in terms of the known. That is why metaphorical language is so indispensable, and why the distinction between poetry and prose finally breaks down. What are we left with? Let’s just say that this book is a testimony of those who have seen God’s face in the mirror, a collection of good words from the kingdom of here and now: much ado about Nothing. Mind is everything; mind is nothing. Mind creates time and space, mind contains a billion galaxies, mind lifts a spoon of oatmeal to its mouth at breakfast. Mind is life and death, God and devil, you and I; mind stands at the top of the mountain; mind cries for its mother’s breast. Mind pulls the universe out of a top hat, bows to its own applause, and walks off the stage, grinning. All Buddhas and all ordinary beings are nothing but the one mind. This mind is beginningless and endless, unborn and indestructible. It has no color or shape, neither exists nor doesn’t exist, isn’t old or new, long or short, large or small, since it transcends all measures, limits, names, and comparisons. It is what you see in front of you. Start to think about it and immediately you are mistaken. It is like the boundless void, which can’t be fathomed or measured. The one mind is the Buddha, and there is no distinction between Buddha and ordinary beings, except that ordinary beings are attached to forms and thus seek for Buddhahood outside themselves. By this very seeking they lose it, since they are using Buddha to seek for Buddha, using mind to seek for mind. Even if they continue for a million eons, they will never be able to find it. They don’t know that all they have to do is put a stop to conceptual thinking, and the Buddha will appear before them, because this mind is the Buddha and the Buddha is all living beings. It is not any less for being manifested in ordinary beings, nor any greater for being manifested in Buddhas. This pure mind, which is the source of all things, shines forever with the radiance of its own perfection. But most people are not aware of it, and think that mind is just the faculty that sees, hears, feels, and knows. Blinded by their own sight, hearing, feeling, and knowing, they don’t perceive the radiance of the source. If they could eliminate all conceptual thinking, this source would appear, like the sun rising through the empty sky and illuminating the whole universe. Therefore, you students of the Tao who seek to understand through seeing, hearing, feeling, and knowing, when your perceptions are cut off, your way to mind will be cut off and you will find nowhere to enter. Just realize that although mind is manifested in these perceptions, it is neither part of them nor separate from them. You shouldn’t try to analyze these perceptions, or think about them at all; but you shouldn’t seek the one mind apart from them. Don’t hold on to them or leave them behind or dwell in them or reject them. Above, below, and around you, all things spontaneously exist, because there is nowhere outside the Buddha mind. When most people hear that the Buddhas transmit the teaching of the one mind, they suppose that there is something to be attained or realized apart from mind, and they use mind to seek the teaching, not realizing that mind and the object of their search are one. Mind can’t be used to seek mind; if it is, even after millions of eons have gone by, the search will still not be over. Suppose that a warrior forgot he was already wearing his pearl on his forehead, and sought for it somewhere else: he might search through the whole world without finding it. But if someone simply pointed it out to him, the warrior would immediately realize that the pearl had been there all the time. In the same way, if you students of the Tao are mistaken about your own mind, not recognizing that it is the Buddha, you will look for it somewhere else, indulging in various practices and hoping to attain something. But even after eons of diligent searching, you won’t be able to attain the Tao. These methods can’t be compared to the elimination of conceptual thinking, when you understand there is nothing that has absolute existence, nothing to hold on to, nothing to depend on, nothing to dwell in, nothing subjective or objective. When you prevent the rise of conceptual thinking, you will be free men, and this just means you will realize that the Buddha has always existed in your own mind. Eons of striving will turn out to be wasted effort; just as, when the warrior found his pearl, he simply found what had been hanging on his forehead all the time, and his discovery had nothing to do with his efforts to find it elsewhere. Therefore the Buddha said, “I didn’t attain a single thing through Supreme Perfect Enlightenment.” It was because he was concerned that people wouldn’t believe this that he taught by less direct methods. This statement of his isn’t idle chatter; it expresses the highest truth. When a thought suddenly flashes in your mind and you recognize its illusory nature, then you can enter into the state of all the Buddhas of the past—not that the Buddhas of the past really exist, or that the Buddhas of the future have not yet come into existence. Above all, don’t wish to become a future Buddha; your only concern should be, as thought follows thought, to avoid clinging to any of them. Nor should you wish to be a Buddha right now. If a Buddha arises, cut him off instantly. Don’t cling to him for even a single moment, because a thousand locks couldn’t shut him in, nor a hundred thousand feet of rope bind him. I will now explain how to free yourselves of that Buddha. Consider the sunlight. You may say that it is near, yet if you pursue it from world to world you will never catch it. You may say that it is far, yet you can see it right before your eyes. Chase it and it always eludes you; run from it and it is always there. From this example you can understand how it is with the true nature of all things, and from now on there will be no need to grieve or worry about such things. Now, please don’t think that when I said you should cut off the Buddha I was being profane, or that when I compared him to the sunlight I was being pious. In Zen we don’t admit either the profanity of the first or the piety of the second. Nor do we think that the first is Buddha-like and the second ignorant. The entire visible universe is the Buddha; so are all sounds. Hold fast to one principle and all the others are identical. On seeing one thing, you see all things. On perceiving any individual’s mind, you perceive all mind. Glimpse one truth, and all truth is present in your vision, for there is nowhere at all which is devoid of the Truth. When you see a grain of sand, you see all possible worlds, with all their vast rivers and mountains. When you see a drop of water, you see the nature of all the waters of the universe. Furthermore, in thus contemplating the totality of phenomena, you are contemplating the totality of mind. All these phenomena are intrinsically empty, yet this mind they are identical with is not mere nothingness. It does exist, but in a way too marvelous for us to comprehend. It is an existence that is beyond existence, a non-existence that is nevertheless existence. Thus we can encompass all possible worlds, numberless as grains of sand, with our one mind. Then why talk of “inside” and “outside”? Since honey is naturally characterized by sweetness, it follows that all honey is sweet. To speak of this honey as sweet and that honey as bitter would be ridiculous. That is why we say that emptiness has no inside or outside. It arises by itself, spontaneous and absolute. Ordinary beings are the Buddha, just as they are. The Buddha is one with them. Both have the same nature. The phenomenal universe and nirvana, activity and stillness—all have the same nature. So do all possible worlds and the state that transcends all worlds. The beings that pass through the six stages of existence, those who have undergone the four kinds of birth, all the worlds with their vast mountains and rivers, enlightenment and delusion—all of them are the same. When I say that they all have the same nature, I mean that their names and forms, their existence and non-existence, are empty. The vast world-systems, uncountable as the sands of the Ganges, are all contained in the one boundless, empty, radiant mind. How then can there be Buddhas who save or ordinary beings who must be saved? If the true nature of all things is the same, how can such distinctions be real? The first of the following essays is one of the most profound and beautiful prose pieces ever written. The second is a set of specific instructions for formal daily practice, which is an essential commitment for those who wish to study the self: to forget the self and be enlightened by all things. When all things exist, there are enlightenment and delusion, practice, life and death, Buddhas and ordinary people. When all things are without self, there is no delusion, no enlightenment, no Buddhas, no ordinary people, no life and no death. Buddhism is beyond being and non-being; so there are life and death, delusion and enlightenment, ordinary people and Buddhas. Thus, when flowers fall we are sad, and when weeds grow we are annoyed. To start from the self and try to understand all things is delusion. To let the self be awakened by all things is enlightenment. To be enlightened about delusion is to be a Buddha. To be deluded in the midst of enlightenment is to be an ordinary person. Then there are those who are enlightened beyond enlightenment, and those who are deluded by delusion. When Buddhas are truly Buddhas, they don’t need to be aware of themselves as Buddhas. But they are enlightened ones. They advance in enlightenment. When we see forms or hear sounds with our whole body and mind, we understand them intimately. But it isn’t like images in a mirror or the moon reflected in water. When we look at one side, the other is dark. To study Buddhism is to study the self. To study the self is to forget the self. To forget the self is to be enlightened by all things. To be enlightened by all things is to drop off our own body and mind, and to drop off the bodies and minds of others. No trace of enlightenment remains, and this no-trace continues endlessly. When we first seek the truth, we think we are far from it. When we discover that the truth is already in us, we are all at once our original self. If we watch the shore from a boat, it seems that the shore is moving. But when we watch the boat directly, we know it is the boat that is moving. If we look at the world with a deluded body and mind, we will think that our self is permanent. But if we practice correctly and return to our true self, we will realize that nothing is permanent. Wood burns and there are ashes; the process is never reversed. But we shouldn’t think that what is now ashes was once wood. We should understand that wood is at the stage of wood, and that is where we find its before and after. There is a past and a future, but its present is independent of them. Ashes are at the stage of ashes, and that is where we find their before and after. Just as wood doesn’t become wood again after it has turned into ashes, a person doesn’t return to life after death. Thus it is taught in Buddhism that life doesn’t become death. For this reason, life is called the Unborn. It is also taught that death doesn’t become life. So death is called the Undying. Life is complete in itself; death is complete in itself. They are like the seasons. We don’t call spring the future summer, or winter the past of spring. Gaining enlightenment is like the moon reflected on the water. The moon doesn’t get wet; the water isn’t broken. Although its light is broad and great, the moon is reflected even in a puddle an inch wide. The whole moon and the whole sky are reflected in one dewdrop on the grass. Enlightenment doesn’t destroy the person, just as the moon doesn’t break the water. The person doesn’t hinder enlightenment, just as a dewdrop doesn’t hinder the moon in the sky. The depth of the dewdrop is the height of the moon. The time of the reflection, long or short, proves the vastness of the dewdrop, and the vastness of the moon in the sky. When the truth doesn’t fill our body and mind, we think we have had enough. When the truth fills our body and mind, we realize that something is missing. For example, when we look at the ocean from a boat, with no land in sight, it seems circular and nothing else. But the ocean is neither round nor square, and its features are infinite in variety. It is like a palace. It is like a jewel. Only to our eyes, only for a moment, does it seem circular. All things are like this. Although there are numberless aspects to all things, we see only as far as our vision can reach. And in our vision of all things, we must appreciate that although they may look round or square, the other aspects of oceans or mountains are infinite in variety, and that universes lie all around us. It is like this everywhere, right here, in the tiniest drop of water. When a fish swims, it swims on and on, and there is no end to the water. When a bird flies, it flies on and on, and there is no end to the sky. There was never a fish that swam out of the water, or a bird that flew out of the sky. When they need a little water or sky, they use just a little; when they need a lot, they use a lot. Thus, they use all of it at every moment, and in every place they have perfect freedom. But if there were a bird that first wanted to examine the size of the sky, or a fish that first wanted to examine the extent of the water, and then try to fly or swim, it would never find its way. When we find where we are at this moment, then our everyday life is itself the manifestation of the truth. For the place, the way, is neither large nor small, neither self nor other. It has never existed before, and it is not coming into existence now. It is simply as it is. Thus in our practice of Buddhism, when we master one truth, we master all truths; and when we complete one activity, we complete all activities. The place is here; the way leads everywhere. So understanding is not easy, because it is simultaneous with the complete attainment of the Buddha’s teaching. Even though we have already attained supreme enlightenment, we may not realize it. Some may, and some may not. “What does it mean that it reaches everywhere?” the monk said. The Master just fanned himself. The monk bowed with deep respect. This is how Buddhism is experienced and correctly transmitted. Those who say that we shouldn’t use a fan, because the wind is everywhere, understand neither permanence nor the nature of the wind. Because the nature of the wind is permanent, the wind of Buddhism brings forth the gold of the earth and turns its long rivers into wine. To obtain the inestimable benefits of meditation, you should first make a firm decision to practice every day. Your meditation room should be clean and quiet. Wear loose clothing and remove your shoes. Sit on a cushion, with legs crossed, in as comfortable a manner as possible. Keep your back straight. Don’t lean to the left or right; don’t tip forward or bend back. Your ears should be in line with your shoulders. Keep your tongue at the roof of your mouth and close your lips. Your eyes should be slightly open, unfocused on the floor at a forty-five-degree angle. Breathe through your nostrils. Before you begin meditation, take several slow, deep breaths. Hold your body erect, allowing your breathing to become normal again. Many thoughts will crowd into your mind. Don’t dwell on thoughts of good or bad. Don’t desire to attain enlightenment. Let your thoughts come and go, without getting involved in them or trying to suppress them. Think the unthinkable. In other words, think no-thinking. In your meditation, you yourself are the mirror reflecting the solution of your problems. The human mind has absolute freedom within its true nature. You can attain this freedom intuitively. Don’t work toward freedom; but allow the work itself to be freedom. Christ’s birth is always happening. And yet if it doesn’t happen in me, how can it help me? Everything depends on that. God must act and pour himself into you the moment he finds you ready. Don’t imagine that God can be compared to an earthly carpenter, who acts or doesn’t act, as he wishes; who can will to do something or leave it undone, according to his pleasure. It is not that way with God: where and when God finds you ready, he must act and overflow into you, just as when the air is clear and pure, the sun must overflow into it and cannot refrain from doing that. Our bodily food is changed into us, but our spiritual food changes us into itself. The Now in which God created the first man and the Now in which the last man will disappear and the Now in which I am speaking—all are the same in God, and there is only one Now. Scripture says, “No one knows the Father but the Son.” Therefore, if you want to know God, you must not only be like the Son, you must be the Son. Many people imagine that there is “creaturely being” here and “divine being” in heaven. This is not true. You behold God in your life in the same perfection, and are blessed in exactly the same way, as in the afterlife. All that is proper to the divine nature is also proper to the just and godly man; therefore such a man performs everything that God performs, and together with God he has created heaven and earth, and he is the begetter of the eternal Word, and without such a man God could do nothing. You might ask, “How can I know if something is God’s will?” My answer is, “If it were not God’s will, it wouldn’t exist even for an instant; so if something happens, it must be his will.” If you truly enjoyed God’s will, you would feel exactly as though you were in the kingdom of heaven, whatever happened to you or didn’t happen to you. Spinoza is one of the three greatest Jewish teachers, along with Jesus and the author of Job, and the only one of the great Western philosophers who deserves to be compared to Lao-tzu or the Buddha. He lived with the irreproachable integrity of someone who understands not in his head but in his blood and bones. 1. It teaches us that we act only from God’s will, that we share in the divine nature, and that we share the more, the more perfect our actions are, and the more we understand God. This doctrine, therefore, besides giving us true peace of mind, also teaches us where our greatest happiness or blessedness lies: in the knowledge of God, by which we are led to do only those things that love and piety advise. From this we clearly understand how far astray from the true estimation of virtue are those who expect to be honored by God with the greatest rewards for their virtue and good deeds, as if these were the greatest servitude—as if virtue and the service of God were not happiness itself and the reatest freedom. 2. It teaches us how we should behave in relation to the things of fortune—those things which are not in our power, i.e., which do not follow from our own nature. For it shows us that we should expect and bear with equanimity both good and bad fortune, since all things follow from the eternal decree of God by the same necessity as it follows from the essence of a triangle that its three angles are equal to two right angles. 3. This doctrine contributes to our communal life in that it teaches us not to hate anyone, not to despise anyone, not to mock or envy or be angry with anyone; and also in that it teaches every man to be content with what he has and to be helpful to his neighbor, not from weak-minded pity, partiality or superstition, but by the guidance of reason alone, as time and circumstance require. 4. Finally, this doctrine also contributes considerably to the larger society, insofar as it teaches how citizens are to be governed and led, not so that they may become slaves, but so that they may freely do whatever things are best. Proposition 15: He who clearly and distinctly understands himself and his emotions loves God, and does so the more, the more he understands himself and his emotions. Prop. 16: This love toward God must engage the mind more strongly than anything else. Prop. 17: God is without passions, and is not affected by any emotion of pleasure or pain. Prop. 19: He who loves God cannot endeavor that God should love him in return. Prop. 20: This love toward God cannot be stained by the emotion of envy or jealousy: on the contrary, it is the more strengthened, the more people we imagine joined to God by the same bond of love. Prop. 23: The human mind cannot be absolutely destroyed with the body, but something of it remains that is eternal. Prop. 24: The more we understand particular things, the more we understand God. Prop. 25: The highest endeavor of the mind, and its highest virtue, is to understand things by the third kind of knowledge [intuition: the kind of knowledge that “proceeds from an adequate idea of the absolute essence of certain attributes of God to the adequate knowledge of the essence of things”]. Prop. 27: From this third kind of knowledge arises the highest possible serenity of mind. Prop. 30: Insofar as our mind knows itself and the body under the form of eternity, it necessarily has a knowledge of God, and knows that it is in God and is conceived through God. Prop. 32: Whatever we understand by the third kind of knowledge, we take pleasure in, and our pleasure is accompanied by the idea of God as its cause. Prop. 33: The intellectual love of God, which arises from the third kind of knowledge, is eternal. Prop. 35: God loves himself with an infinite intellectual love. Prop. 36: The mind’s intellectual love of God is the very love of God by which God loves himself, not insofar as he is infinite, but insofar as he can be explained through the essence of the human mind, considered under the form of eternity; i.e., the mind’s intellectual love of God is part of the infinite love with which God loves himself. Prop. 42: Blessedness is not the reward of virtue, but is virtue itself; nor do we rejoice in it because we restrain our lusts, but, on the contrary, it is because we rejoice in it that we are able to restrain our lusts. Note. — I have thus completed everything that I wished to demonstrate concerning the mind’s power over the emotions and the mind’s freedom. From this it is apparent how powerful the wise man is, and how greatly he surpasses the ignorant man, who is driven only by his lusts. For not only is the ignorant man distracted in many ways by external causes and never able to enjoy true serenity of mind, but he also lives as if he were unaware of himself or God or things; and as soon as he ceases to be acted upon, he ceases to be. The wise man, on the other hand, insofar as he is considered as such, is hardly ever troubled in spirit, but, being conscious of himself, and of God, and of things, by a certain eternal necessity, he never ceases to be, but always possesses true serenity of mind. If the way I have pointed out as leading to this result seems exceedingly hard, it can nevertheless be found. It must indeed be hard, since it is found so seldom. For if salvation were readily available and could be found without great effort, how is it possible that it should be neglected by almost everyone? But all things excellent are as difficult as they are rare.